You don’t have to take the exemption, but if you would like too, this is what we can offer in our TITLING categories. Level I – Playing field is 40 X 40 minimum, may be larger. Goal is 10′ across, once the Team enters the playing field, handler may not leave the goal area. No Rewards until you walk off the playing field and have completed the task. You may talk, touch, praise your dog, but no toys or food allowed during play. No mat, 4 balls, two markers for the goal area, one marker in each corner of the playing field. Handler and dog must remain in the video frame at all times. Task I – 1 minute – Handler walks in with dog on leash to the goal area. Dogs leash is taken off, and the dog must remain in a stand, sit, or down stay. Dog may work off of the right or left side of handler, and may also switch sides. Four balls are to be randomly placed in the playing field. As a team, the handler and dog are to walk around the playing field, the dog does not have to be in a perfect heel by any means, but must be with the handler. Handler is allowed to remind their dog to remain in their space, but NO CORRECTIONS are allowed. Weaving through, around and by the balls, diagonally, in a circle, back and forth. All four balls must be passed or circled WITHOUT the dog interacting with them in anyway. Team finishes in the goal area, leash is put back on, Team may exit playing field in control and as a Team. Team is to be in motion for this exercise, there is no stopping along the way to collect your dog. Once the task is complete the handler is to put the leash on their dog and exit the playing field. Task II – 1 minute – Handler walks in with dog on leash to the goal area. Dogs leash is taken off, and the dog must remain in a stand, sit, or down stay, until the handler releases for task. Dog may work off of the right or left of handler to start. One ball on playing field, midway, center. Handler must send dog out behind ball, wait in a stand, sit, or down, for 5 seconds, and then call back in WITHOUT pushing the ball. The three reaming balls should be randomly placed in the playing field as a distraction. This must be performed sending the dog, twice counter, and twice clock (4 repetitions total). Once the task is complete, the handler is to put the leash on their dog and exit the playing field. Task III – 1 minute – Handler walks in with dog on leash to the goal area. Dogs leash is taken off, and the dog must remain in a stand, sit, or down stay, until the handler releases for task. Dog may work off of the right or left of handler to start. Two balls on playing field at 30′ from goal line, center and 5 feet apart from each other. The two remaining balls should be on the field as a distraction. Handler is to send the dog out behind the balls, and stand, sit, or down stay for 5 seconds. When the handler releases for the push, dog is to bring the ball into the goal area. Repeat for the second ball. Once counter, and once clock (2 repetitions total). Once task is complete, the handler is to put the leash on their dog and exit the playing field. Level II – Playing field is 40W X 50L minimum, may be larger. Goal is 10′ across, once the Team enters the playing field, handler may not leave the goal area. No Rewards until you walk off the playing field and have completed the task. You may talk, touch, praise your dog, but no toys or food allowed during play. No mat, 5 balls, two markers for the goal area, one marker in each corner of the playing field. Handler and dog must remain in the video frame at all times. Task I – 2 minutes max. – Handler walks in with dog on leash to the goal area. Dogs leash is taken off, and the dog must remain in a stand, sit, or down stay. Dog may work off of the right or left side of handler. All 5 balls are to be lined up parallel to the goal, 35′ out. Have them placed 5′ apart from each other. Dog may be sent out, counter or clock, and must go behind the balls. Handler may verbally stop the dog behind the ball of their choice. There is a 5 second wait before being released to push, on the FIRST BALL and only the FIRST BALL. Ball must come into the goal area. 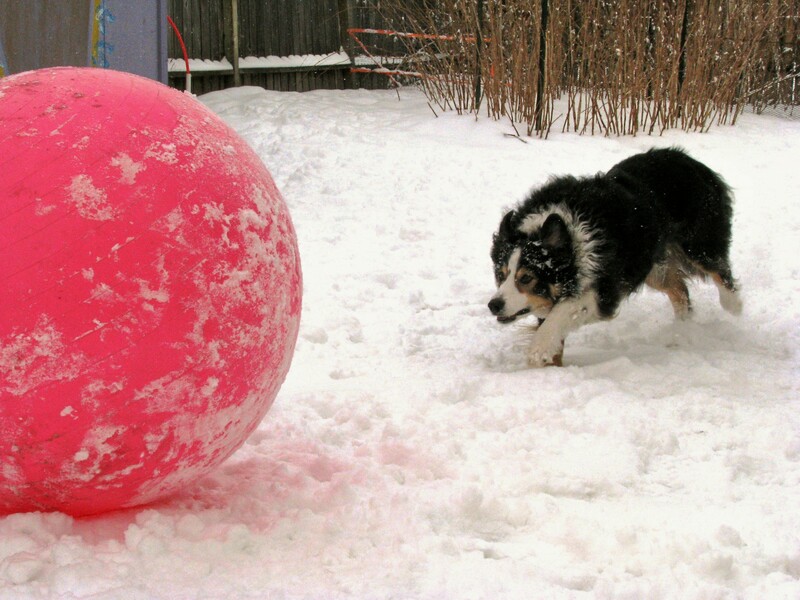 As soon as the ball enters the goal area, the handler can send their dog out behind the balls. There is no wait necessary with the remaining four balls. HOWEVER, the dog must push the ball that is designated by the handler, not just randomly be picking up balls. Once all 5 balls have been received, handler is to put the leash on their dog and exit the playing field. Task II – 2 minutes max. – Handler walks in with dog on leash to the goal area. Dogs leash is taken off, and the dog must remain in a stand, sit, or down stay. Dog may work off of the right or left side of handler. All 5 balls are to be lined up parallel to the goal, 35′ out. Have them placed 5′ apart from each other. Dog may be sent out, counter or clock, and must go behind the balls. Handler may verbally stop the dog behind the ball of their choice. There is a 3 second wait (minimum) before being released to push, on all balls, except the 5th ball. For this task the dog may not push the ball that they are lined up behind, handler must redirect the dog to push a different ball. The 5th ball is the only ball that does not require a wait, or a redirect, push in! Once all 5 balls have been received, handler is to put the leash on their dog and exit the playing field. Task III – 2 minutes max. – Handler walks in with dog on leash to the goal area. Dogs leash is taken off, and the dog must remain in a stand, sit, or down stay. Dog may work off of the right or left side of handler. All 5 balls are to be lined up diagonally on playing field, the furthest is 35′, the closest is 10′ from goal line (and to the side). Roughly 5-7′ apart. The only ball on the center line is the middle ball (3). Dog may be sent out, counter or clock, and must go behind the balls. Handlers choice for order. There is a 5 second wait before being released to push, on the FIRST BALL and only the FIRST BALL. The dog, once released, must push the ball into the goal area. Once the ball enters the goal area, the handler can send their dog back out for another ball. All 5 must come into the goal area. Once all 5 balls have been received, handler is to put the leash on their dog and exit the playing field. Task IV – 2 minutes max. – Handler walks in with dog on leash to the goal area. Dogs leash is taken off, and the dog must remain in a stand, sit, or down stay. Dog may work off of the right or left side of handler. All 5 balls are to be lined up perpendicular to the goal on the center line. The furthest ball is at 35′, spaced 5-7 feet apart. Pick up and push from nearest to the furthest, into the goal area. The dog does not need to go all the way out past all of the balls. When the dog is released, the ball nearest the goal is to be brought in first, and so on, until the ball furthest away is the remaining ball. There is no wait behind the balls, UNTIL the final ball. When the handler sends dog out to the final ball, there is a 10 second stay (stand, sit or down) and then a push in to the goal area. Once all 5 balls have been received, handler is to put the leash on their dog and exit the playing field. Level III – Playing field is 50W X 90L minimum, may be larger. Goal is 10′ across, once the Team enters the playing field, handler may not leave the goal area. No Rewards until you walk off the playing field and have completed the task. You may talk, touch, praise your dog, but no toys or food allowed during play. No mat, 5 balls, 1 sand weighted or odd shaped ball, two markers for the goal area, one marker in each corner of the playing field. Handler and dog must remain in the video frame at all times. Task I – 3 minutes max. – Handler walks in with dog on leash to the goal area. Dogs leash is taken off, and the dog must remain in a stand, sit, or down stay. Dog may work off of the right or left side of handler. One ball is 15′ off of the left of center at 60′, second ball is center at 80′. Handler sends dog out to the furthest ball. Dog must wait for 5 seconds. When handler releases the dog to push, the dog must bring the ball into the goal area. Repeat for second ball. Once both balls have been received, handler is to put the leash on their dog and exit the playing field. Task II – 3 minutes max. – Handler walks in with dog on leash to the goal area. Dogs leash is taken off, and the dog must remain in a stand, sit, or down stay. Dog may work off of the right or left side of handler. Both balls are placed center at 75′, balls are 5 feet apart. First send is counter, second send is clock. Dog must go behind the balls and wait for five seconds. For the first push, which ever ball the dog stops behind, handler must redirect dog to push the other ball. The ball must be brought into the goal area. Once the ball is received the handler can send the dog out for the second ball. No wait necessary on the second ball. Once both balls have been received, handler is to put the leash on their dog and exit the playing field. Task III – 5 minutes max. – Handler walks in with dog on leash to the goal area. Dogs leash is taken off, and the dog must remain in a stand, sit, or down stay. Dog may work off of the right or left side of handler. Regular balls are to be placed at 75′, one 15′ off center to the right, and one 15′ off center to the left. The sand weighted or odd ball is to be placed at 50′. Handlers choice for order brought in. No waits behind ball. Once a ball reaches the goal the dog may be sent out for the next ball. Once all balls have been received, handler is to put the leash on their dog and exit the playing field. Task IV – 5 minutes max. – Handler walks in with dog on leash to the goal area. Dogs leash is taken off, and the dog must remain in a stand, sit, or down stay. Dog may work off of the right or left side of handler. All 5 regular balls are placed at the 75′ line parallel to the goal, 5′ apart from each other. Handler must send dog out behind balls. There is a 5 second wait before being released to push, on the FIRST BALL and only the FIRST BALL. Balls must be brought in right to left, handlers right to left. Once a ball is received in the goal area the dog can be released for the next ball. Once all 5 balls have been received, handler is to put the leash on their dog and exit the playing field. Level IV – Once the Team enters the playing field, handler may not leave the goal area. No Rewards until you walk off the playing field and have completed the task. You may talk, touch, praise your dog, but no toys or food allowed during play. No mat, 5 balls for task I, and 8 balls for task II, two markers for the goal area, one marker in each corner of the playing field. Handler and dog must remain in the video frame at all times. Task I – 3 minutes max. – Playing field is 20 X 30 minimum, may be larger. Goal is 5” across. Handler walks in with dog on leash to the goal area. Dogs leash is taken off, and the dog must remain in a stand, sit, or down stay. Dog may work off of the right or left side of handler. Balls and obstacles may be set from 15-30 feet away from the goal, no closer to the goal. The object of Task #I is to bring in the balls, one at a time, from locations that are not quite so obvious. There is no mandatory wait before pushing any of these balls. when a ball is brought in, the dog may be released for the next push. 1st ball – floating in a water element (kiddy or paddling pool). The water element does not have to be deep, but enough to float the ball. And the dog needs to be able to enter the water element safely, and leave safely. The dog must have to enter the water at some point, not just push it out of water from the side area. 2nd ball – on an object that gets the ball off the ground to just above the dogs shoulder height. This object must be safe if the dog knocks it over while pushing the ball off. 3rd ball – Behind an element where the dog cannot see it (stand of trees, screen, large can, around the side of the house, etc.). The dog must be sent out to a location where the ball cannot be seen on the outrun. 4th ball – odd shaped, 1/2 deflated, or weighted with sand. 5th ball – wedged between two items that will require your dog to push and release it (two tight trees, two cans, two chairs. If the ball easily roles with one light tap from the dog this is not tight enough. The dog should have to work to release it.) Once all 5 balls have been received, handler is to put the leash on their dog and exit the playing field. Task II – 4 minutes max. – Playing field is 40 X 50 minimum, may be larger. Goal is 10” across. Handler walks in with dog on leash to the goal area. Dogs leash is taken off, and the dog must remain in a stand, sit, or down stay. Dog may work off of the right or left side of handler. A tight cluster (not linear but clumped) of four balls, touching, at 40′ from the goal, 10′ off of the center line to the right. A tight cluster (not linear but clumped) of four balls, touching, at 30′ from the goal, 15′ off of the center line to the left. Dog is sent out, no wait required behind any of the balls, and must bring in a ball from the right cluster. When the ball enters the goal, the dog is then sent out to bring in a ball from the left cluster. Balls brought in are to be alternating from right cluster to left cluster until all have reached the goal. If a ball from one cluster crosses the center line, it is still considered a ball from the side it started on, and alternating must continue in this fashion. Once all 8 balls have been received, handler is to put the leash on their dog and exit the playing field. Level V – Playing field is 50W X 80L minimum, may be larger. Goal is 10′ across, once the Team enters the playing field, handler may not leave the goal area. No Rewards until you walk off the playing field and have completed the task. You may talk, touch, praise your dog, but no toys or food allowed during play. No mat, 8 balls, two markers for the goal area, one marker in each corner of the playing field. Handler and dog must remain in the video frame at all times. Task I – 6 minutes max. – Handler walks in with dog on leash to the goal area. Dogs leash is taken off, and the dog must remain in a stand, sit, or down stay. Dog may work off of the right or left side of handler. Balls are placed at 80′, some type of marker at 40-50 feet. They can be set in any configuration, handlers choice. Dog is sent out to the ball of the handlers choice, a 3 second wait is only required behind the first ball, no other waits required. Once the dog is released, the dog is to push the ball into the 40-50′ mid field area of the playing field and then stop. If the ball continues to roll that is fine, but the dog needs to stop. The handler is to send the dog out to the remaining 7 balls, from this mid field position, and continue in the pattern. At no time should the dog return to the goal area where the handler is standing. Once all 8 balls have reached the mid filed area, the dog is to be called to the goal area, and each ball brought into the final goal where the handler is standing. Once all 8 balls have been received, handler is to put the leash on their dog and exit the playing field. Task II – 5 minutes max. Handler walks in with dog on leash to the goal area. Dogs leash is taken off, and the dog must remain in a stand, sit, or down stay. Dog may work off of the right or left side of handler. Balls are lined up between 50-60′ from the goal line. Balls lined up perpendicular to the goal, 10′ off center line to the right, 4 balls lined up perpendicular to the goal, 10′ off center line to the left. The dog is to alternate between right and left side, and bring in the closest to the furthest ball. Right to left and so on, until all 8 balls have arrived at the goal. No wait behind balls are required. Once all 8 balls have been received, handler is to put the leash on their dog and exit the playing field. Task III – 4 minutes max. Handler walks in with dog on leash to the goal area. Dogs leash is taken off, and the dog must remain in a stand, sit, or down stay. Dog may work off of the right or left side of handler. Only 3 balls in play for this task. 1st ball at 80′, 2nd ball at 50-40′, 3rd ball at 30-20′. They can be positioned right or left of center line, handlers choice. The dog is sent out to furthest ball, no wait required, the dog is to push, and then be asked to stop at the 50-40′ mark, leave the ball they were pushing, and pick up the next ball. The dog will then be asked to stop at the 30-20′ mark, leave the ball they were pushing and pick up the new ball. The final ball is the only ball that needs to be brought into the goal area. When the one ball has been received, handler is to put the leash on their dog and exit the playing field. GOOD LUCK! Have fun, Push on! Awesome stuff Nancy ! It’s such a great idea to have no due date for this. We can work on everything at our own speed. Tasks are going to keep us on our toes ! That is the hope! To work through a LEVEL and when you are ready, submit your work. WOOP! so excited… wait till you see the next two levels, ROCK AND ROLL! Do I need to submit a new release form before I get started or will the previous one cover everything this time around again ? Nancy I submitted the form and payment already, is that okay? Sorry about that . Yes, I think I refunded the Titling payment to you, submit that with your titling form and video. I do have your League fee and paper work and you are signed up again. Thank you! Okay, I was meaning the from that I had to sign and scan in and email back to you from last time. Is that one only for Matches ? nope we are good on that, thanks! I was reading ahead through some Levels. Where it says a dog is not required to wait before pushing, does that leave it open then to either wait or not unless specifically asked not to wait ? correct, if a wait is not required than it would be your choice to either do a fast push to stay within the time allowed, or a brief wait if you want to redirect. I have a Question, dogs that are classed as Tea Cup size, do they have a different field sizes and shorter distances for the WTL “Leagues and Titles” ? We have a couple of small dogs in out our classes and club that were wondering. since we haven’t run into that yet, yes if a tea cup entered I would adjust the field size and the amount of balls for sure. everything would be less. That only seems far. How would I incorporated the senior exemption for task III and IV for Level II since the balls are not placed parallel? My guy is 14 now. He LOVES his treibball but time is really becoming a big challenge, distance not so much.